CMLL tecnico. The Horuz name is new, but he's in about the same spot. Debuted in late 2007. as El Hijo del Faraon, with the original El Faraon presenting him the mask in Arena Coliseo Guadalajara, and treated like a big deal...for two weeks, then disappearing. He turned up on the indies for a bit, before being brought into CMLL Mexico City in the summer of 2008. Seemed to have promise, but got lost in the shuffle compared to the other Gen75 wrestlers brought in at the same time, and could not crack the first or second match. That year might have just been a training run. Hijo del Faraon vanished in February of 2009, and Horuz debuted in June of the same year. He's struggled since debuting on that name, and has fallen in compared to those of his generation. It should be noted Horuz is not related to El Faraon. Both men have explained his use of Hijo del Faraon as Faron being almost like a godfather to him, so it seemed like a good idea. They say they became uncomfortable with the deception and decided to end it. Horus has said he considered using the name Nieto el Angel Blanco instead, but felt there were too many who've used the name already. 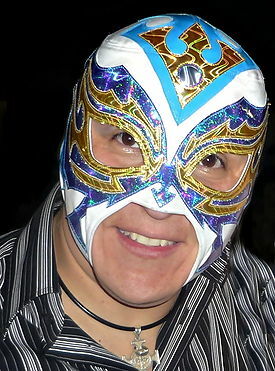 During his absence from CMLL, Horus apparently masqueraded as Rey Misterio Jr. Misterio's popularity greatly increased in the late 00s, due to his matches in WWE being broadcast in many countries. It was not uncommon for promoters in Latin countries or areas who could not bring in WWE to instead bring in substitutes. Usually, Hijo de Rey Misterio was misleading advertised as his famous cousin, but Horus did the same for one appearance in Bolivia. This page was last edited on 16 March 2018, at 20:43.